For Thousands of Vintage Movie Posters. If it has any minor defects like pin holes, creases, etc. Get notified of our AUCTIONS & NEW INVENTORY instantly! This is a genuine 40" x 60" U. Card stock ORIGINAL MOVIE POSTER issued by the studio when the film was released and meant for theatrical display. This poster is ROLLED, never folded. This is a very large poster! These can be very difficult to find in any condition! A long time can go by without one of these coming up for sale. You will have trouble finding a nicer one. EXTREMELY RARE COMPARED TO A ONE SHEET. Primarily offered for major motion pictures only, these were displayed both inside and outside of theaters. A 40x60 would cost the theater up to 20 times as much as a one sheet to rent. For most titles only a few hundred were usually printed, and it was only printed once. Unlike the one sheet which was printed in quantities of 10,000 and up. VERY difficult to find in Near Mint con dition because the card stock can crease easily. No tears, no tape, no pin holes, no writing, no stains. This poster is considered to be within that class and is definitely INVESTMENT QUALITY. Sometimes it isn't possible to do this. Sometimes we can't roll a folded poster. Please note that if we hold your items for longer than 30 days they will NOT BE RETURNABLE. WE TAKE EXTRA SPECIAL CARE WHEN WE PACKAGE YOUR ITEMS. Folded posters are placed in a plastic bag or envelope and in between STRONG pieces of cardboard and taped together before being placed in the package. Rolled posters are put into a plastic sleeve and then placed in a HEAVY-DUTY TOUGH 3 or 4 diameter thick walled PVC tube. We roll the poster into a smaller diameter than the tube. This is VERY IMPORTANT because it gives the edges strength and helps to prevent them from getting wrinkled. We add soft cushioning material also very important! On the ends to prevent them from getting damaged. We stamp FRAGILE: DO NOT BEND on the outside of the package. To protect ourselves, we insure expensive items for the FULL AMOUNT. These combined charges can add up to 25% or more to your final cost. For other European countries the charges will differ. Please check with your postal system on their procedure for packages from overseas so you are not unpleasantly surprised. You must notify us before sending it back. This is extremely rare, but it does occasionally happen. Unless otherwise specified in the description, ALL POSTERS ARE ORIGINAL MOVIE POSTERS original theatrical movie posters that were displayed or meant for display (unused) in theaters at the time the movies were released. We will put in writing that we guarantee it to be an Original Movie Poster. 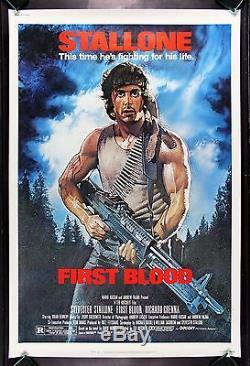 The item "FIRST BLOOD CineMasterpieces HUGE 40x60 ORIGINAL MOVIE POSTER NM-M 1982 RAMBO" is in sale since Saturday, July 25, 2015.